Use this guide to learn how to design an exceptional user experience for customers connecting your product to Nest. Note: Read this guide thoroughly and follow all the guidelines before you submit your Works with Nest client for review. Write meaningful permission descriptions. Typical authorization flows only include the kind of data that will be shared. We take that one step further by requiring a description that explains how your Works with Nest product will use that data. Note: Because all information is ultimately owned by the Nest user, it can only be shared when the user explicitly allows it. A customer's first impression of your Works with Nest product is when you ask for access to their Nest device data. The goal of the authorization experience is to be transparent and clear about how you'll use customer device data. For more information on how to write effective permission descriptions, see the Permissions Overview. After authorization, your users can view permissions or remove access via the Nest app or on the web. Make it easy to navigate. Nest accounts can have multiple homes (structures) within them, so your Works with Nest product must check for this scenario and handle each space correctly. For example, products within different homes can often have the same name (for example, Hallway Thermostat). Your Works with Nest products must make it clear which device is being accessed. In cases where your users have multiple structures, you'll need to offer a structure picker. The structure picker should make it easy to differentiate between devices in structures, and show the structure name, the device location (WHERE), and the device type. Users should be able to easily switch between devices when there is more than one of each type. Understand home and away device behaviors. Home and Away are attributes of a Nest home that devices can use to adjust their behaviors. For example, when Home/Away Assist is enabled and a structure is set to Away, Thermostats have the option to adjust to energy-saving temperatures. There are many possibilities for your Works with Nest product to trigger behaviors based on Home or Away states. Transitions between home and away. Home and Away are set via user interaction in the Nest app or on the Nest Thermostat. Works with Nest products that set Home or Away state must prompt the user and require a manual confirmation for each Home/Away transition. For more info, see the Away Guide. Be extraordinary. Your Works with Nest product should add something new and interesting that delights your users and enhances their lives. You have a unique product - let's explore what we can do together. Context is everything. Share information from your app and give your users new context about events or actions. Maybe your app knows when pets are inside or outside of the home. When a sound event occurs and the pets are inside, your app might send an alert with an image taken at that moment, plus a link to the Nest Cam live feed. Your users can follow the link and see if their pets are safe, and if they've knocked over the herb garden in the kitchen window again. Nest Protect—Where there's smoke, there's not necessarily a fire. If the status changes from "smoke detected" to "smoke clearing", don't say that the home is now safe—just report the new alarm state. Your Works with Nest product must use the same smoke, CO, and battery descriptions as Nest. Nest Cam—If Nest Cam detects a loud sound, report only that a "sound event" or a "loud noise" occurred, and add context based on your product's unique features. Your Works with Nest product must use the same camera event descriptions as Nest, for example: "Your camera detected sound on [camera name] at [timestamp] on [date]" or "Your camera detected motion on [camera name] at [timestamp] on [date]". Nest Thermostat—Your Works with Nest product must use the same thermostat state descriptions as Nest. Ask permission. 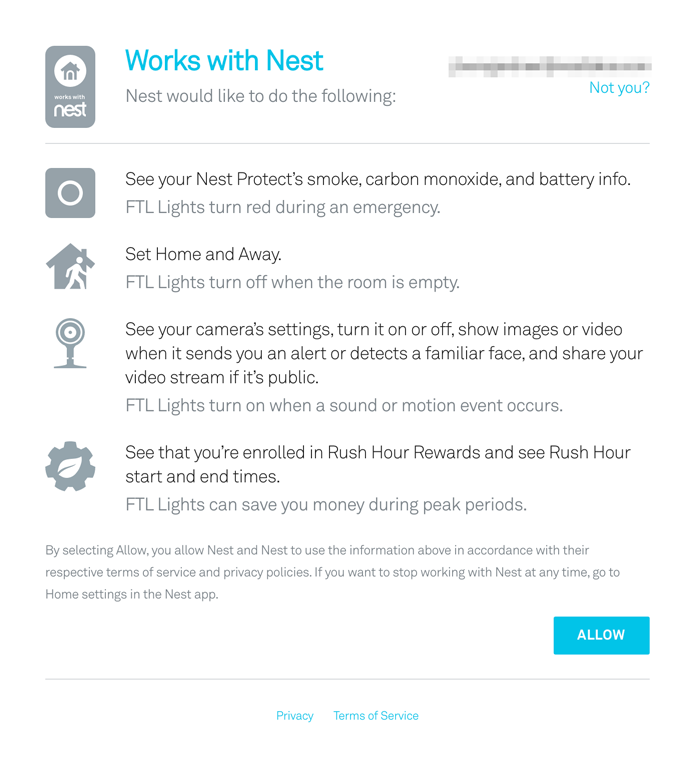 When users choose to connect your Works with Nest product to their Nest account, they authorize you to access their Nest device data. When your Works with Nest product decides it should take an action, be sure you have the user's permission to make that kind of change. Note: Keep your users informed and ask for permission before you take action. Some features require direct user interaction. Even if you have user permission to control a device, sometimes you'll still need the user to confirm something manually before you take action. For example, if your Works with Nest product has a feature that sends an alert with an image of guests arriving, but the front door Nest Cam is off, you will need to turn it back on. Be sure that the user is ok with that first. Read the room. Pay attention to what's happening in a space. Because users can access their devices from anywhere (a Works with Nest product, the Nest app, or manually at the device), the device state can change at any time. Note: Check the data before you make a change. Remember that you're not alone in controlling a device, so don't expect the device or structure to remain in the last state you recorded. Manage data well. Do not retain historical data for more than 10 trailing days from the date when your Works with Nest product receives the data, as noted in our Developer Terms of Service. This retention policy applies to any collected sound or motion events, cached images, and any other stored data. Note: Per the Nest Developer Terms of Service, you are responsible for all shared device data, including deauthorized access tokens, and must remove all data from your app storage when a Works with Nest connection is removed. This policy is in place for all users and all subscription types (including users with no active subscription). To learn how to remove a Works with Nest connection, see the Deauthorization Overview. Honor user privacy. When a user grants you access to their connected devices, be sure to take precautions to protect their privacy. Your app and any registered products must make reasonable efforts to protect user data, which includes personally identifiable information (PII). If you do not protect your user's privacy according to the Nest Developer Terms of Service, we will suspend your account and terminate access to the Nest API. Your copy should include a high-level description of your Works with Nest product, reflecting the seamless interaction between your product and Nest devices. Avoid describing any Nest product as "smart", "smarter", "brainy", "gadget", "safe", "safer", etc. Use Nest Leaf™ or "the Leaf"
The plural form of "Nest Leaf" is "Nest Leafs"
DO NOT use "Nest Leaves"
Note: You must request marketing review and get approval before you use any of the Nest brand assets. Because Works with Nest products are able to read and write to devices in a user's home, we require developers to notify users of all Works with Nest product actions. Users will see your product name in Works with Nest and Nest Energy History. 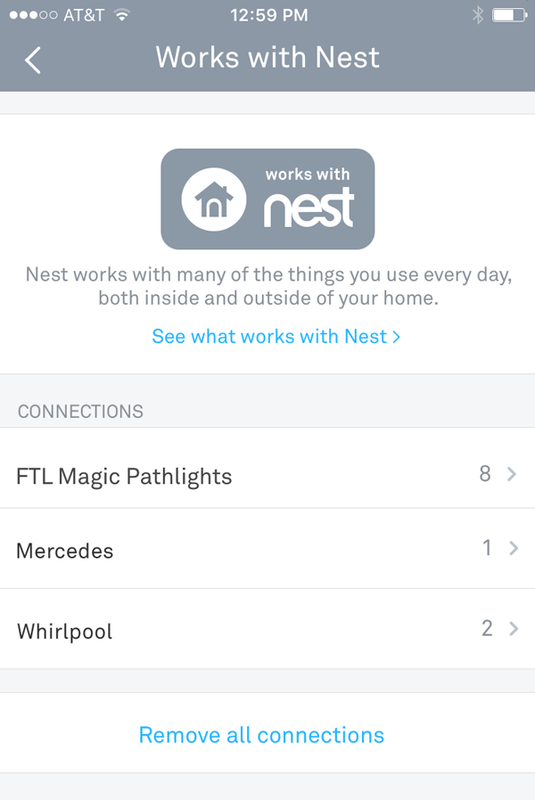 From Works with Nest, a user can see a list of all authorized Works with Nest products. 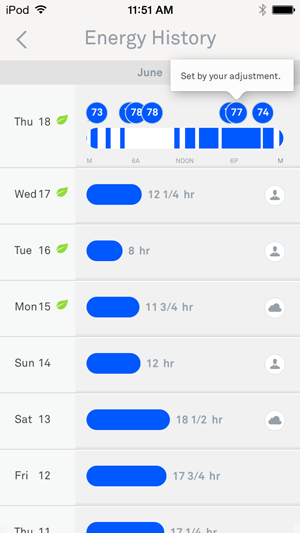 Any modifications made to HVAC settings will be reflected in Nest Energy History, and the Works with Nest product that made the modification will be shown.